If you think that winters in Paris are grey and miserable, you’re in for a surprise. Paris is not only known as the city of love, but also as the city of lights; possibly because of the Enlightenment, possibly because it’s a city brimming with light all year round. It doesn’t even have to be sunny to feel like the city is glowing. Paris is always worth the trip, come rain come shine! At my last photoshoot at the Eiffel Tower in January I was lucky. The sun was shining, and it was so warm that you could almost think spring had arrived in Paris. No need for winter coats! Because the light walls of the Trocadéro reflect the sunlight, there’s no need to bring reflector panels. No matter the season, photoshoots in Paris are always a great idea. The lighting may shift, but every season in Paris makes for a different, unique atmosphere. Photographers have to learn to adapt to the lighting of the moment. While you can use sunlight to great effect, an overcast sky diffuses the light like a giant reflector panel, and there are no shadows that can make or break an image. When doing portrait photos, soft light is an advantage. But in the end, it’s a matter of taste. What do you want to express with your photographs? As shadows creep along Parisian streets, I decide to make use of the back light to take some romantic pictures. Depending on the photograph, back light can also be used to achieve a dramatic effect. The sun coming up behind the Eiffel Tower is especially romantic. The Eiffel Tower is Paris’ landmark, and it’s a romantic symbol known everywhere. Couples from all over the world come to the Eiffel Tower to celebrate their love. They have a photographer document their wedding proposal, they get married in Paris, and they have photoshoots during their honeymoon in Paris. What’s special about the light at the Eiffel Tower? The reason might be geological. Many of the cities buildings are built with Parisian limestone, which reflects light. That way Paris feels friendly even in the dark of winter! Fancy a professional photoshoot with me in Paris? Couples photoshoots are a fun experience. 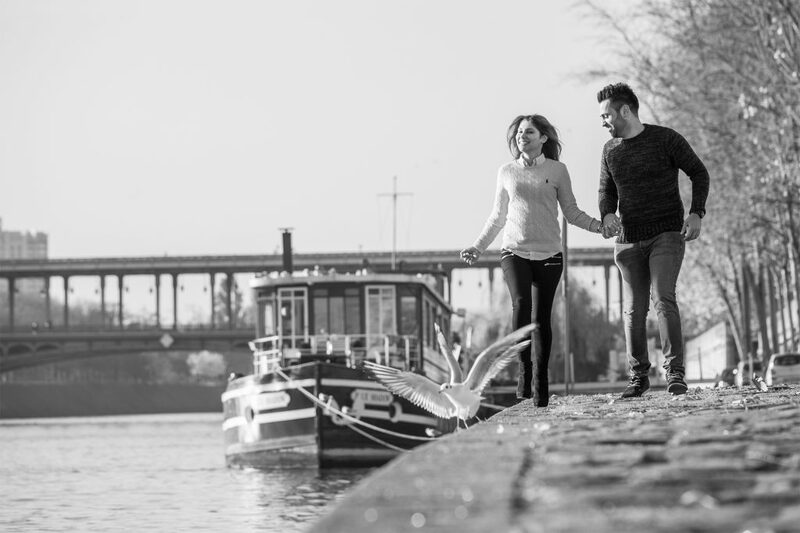 I offer professional photoshoots in Paris, especially at the Eiffel Tower and its surroundings, such as the banks of the Seine and the Pont de Bir-Hakeim. Don’t hesitate to contact me if you have any questions or if you’d like to book a photoshoot.